In a small bowl combine Worcestershire, A1, salt, pepper, thyme, rosemary, onion powder, garlic powder and bay leaf. Rub roast first with olive oil and then rub mixture. Refrigerate 6 hours, uncovered. Remove from refrigerator and let come to room temperature. Preheat oven to 450 degrees F. Roast 15 minutes. Reduce heat to 275 degrees F and continue to roast 1 hour or until internal temperature reaches 135 degrees F for medium rare or 145 degrees F for medium. Remove from oven and let sit 15 minutes. Slice meat and grate fresh horseradish on top. 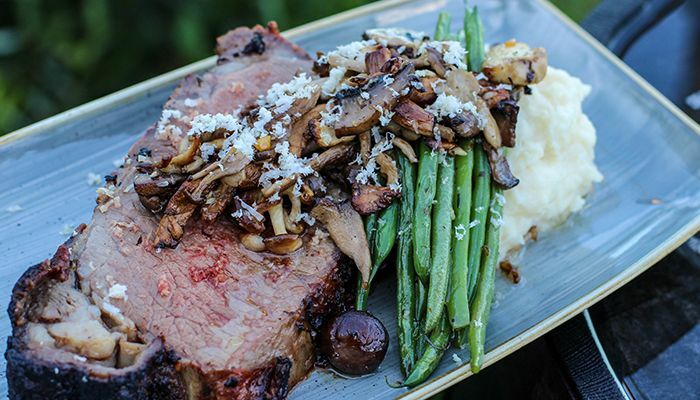 Serve with Green Beans with Roasted Forest Mushrooms. Preheat oven to 400 degrees F. In a medium bowl combine mushrooms, olive oil, garlic, shallot, thyme, salt and pepper. Spread mixture on baking sheet, toss to coat and roast 20 minutes. Remove from oven, add butter, steamed green beans and lemon zest and toss to coat.